You may have noticed these brightly colored critters on your Milkweed. 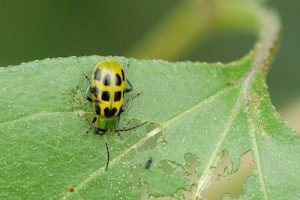 This Aphid species is bright yellow bodied with black legs. They are usually clustered on the stems of Milkweed. Use a water hose to spray the aphids off your plants. Spraying insecticides is not necessary, Milkweed can usually handle large populations of this aphid without any major damage. 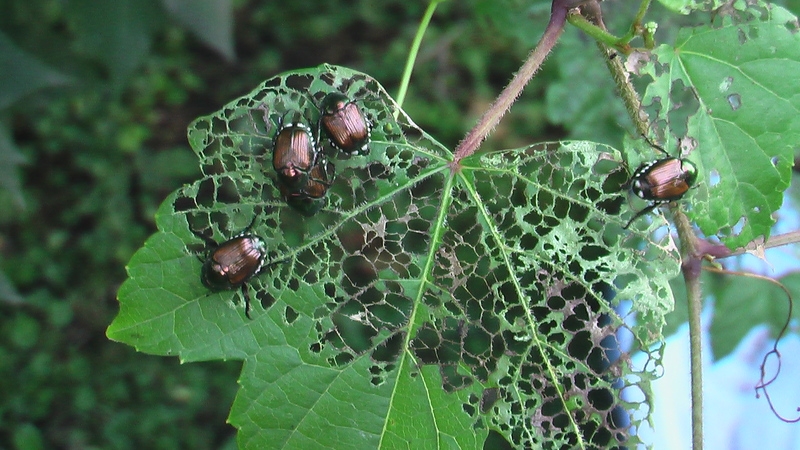 These annoying beetles feed on over 300 species of landscape plants. 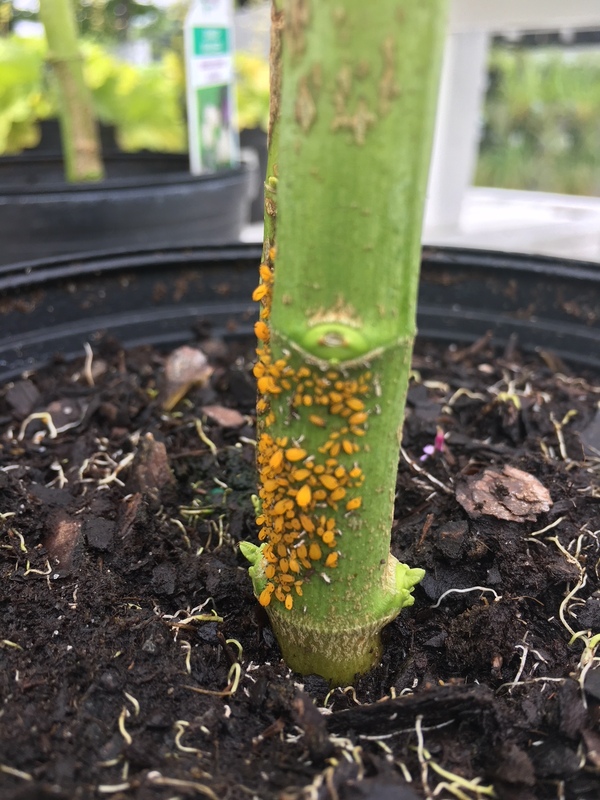 They will decimate the leaves of our precious Roses, Raspberries, Zinnias, and more. 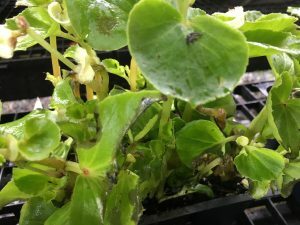 As they feed, they release pheremones that lure more beetles to feed and breed on our favorite plants. Physically knocking them off your plants into soapy water helps prevent massive populations. You can also use sprays such as Neem Oil and Seven to kill them and prevent further damage to your plants. These caterpillars build homes inside a slender bag dangling from your common evergreens such as Cypress, Arborvitae, Cedars, and Laurels. 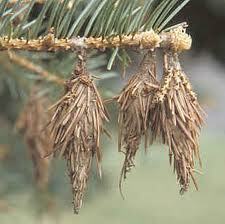 They eat the buds of these landscape plants, causing dieback and dead spots throughout the plant. Hand picking the bags a s soon as you see them goes a long way. After picking the worms of throw them away, do not compost them. 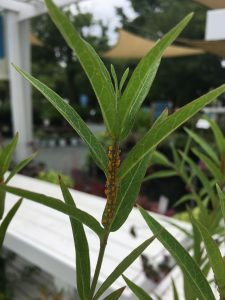 You can also spray your plants with Neem Oil or Sevin to kill and prevent further damage. 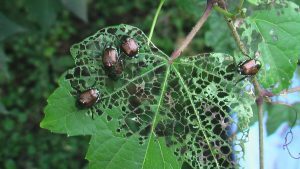 Cucumber beetles chew holes in your plant leaves. They can quickly consume your precious cucumber, melon, and squash plants. Cucumber beetles can also transmit diseases like bacterial wilt and cucumber mosaic virus. Control your beetle damage by spraying with organic Neem Oil regularly every 7-10 days. 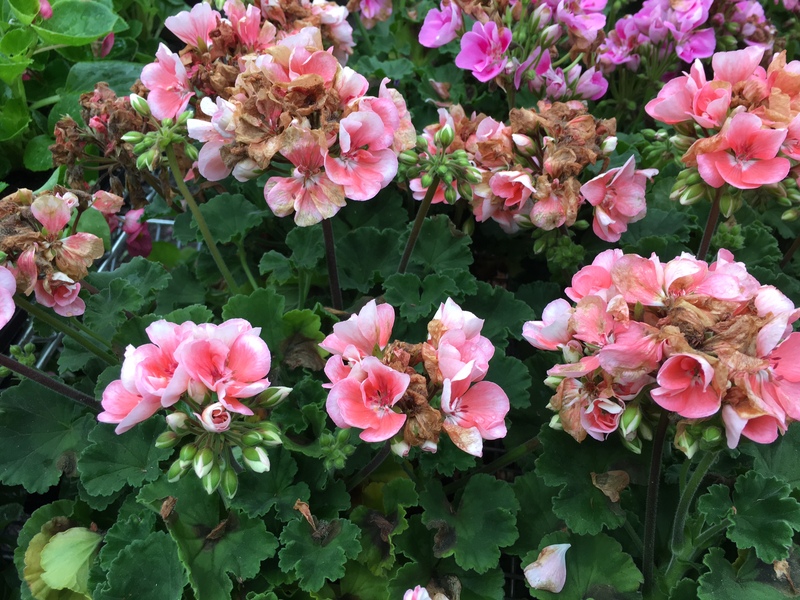 Wet weather makes many beautiful blossoms turn brown and mushy….Simply snap the water damaged blossoms and yellow leaves off, allow plant to dry and fertilize for more blooms to come. This wet weather also brings grey mold to our recently planted begonias and geraniums. Too much moisture and lack of air flow are a perfect storm for the grey mold (nasty) to appear. Best practice is to pick out the moldy areas and air them out as best as you can when the sun comes back out.